The shape of Guadeloupe looks like a butterfly. 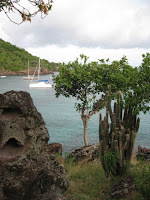 After our fast crossing from Antigua, we touched the left wing in a small town, called Deshaies. I still don’t know how to pronounce it, but we spent two nights there to get some rest. 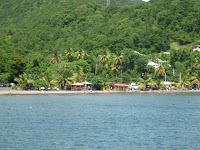 Deshaies is a small fishing village that reminded us of the towns in the Dominican Republic. Nothing special was happening, a variety of food was hard to find and the little community just did its thing. There was no good beach, but the hilly surroundings were very green and we discovered that the path along the river was very enjoyable. We walked Darwin there in the morning, while the jungle around us made the air moist and the mango trees dropped their fruits in massive quantities. We altered our plans a bit and decided to follow the west coast. We would do the other things on our way back north. 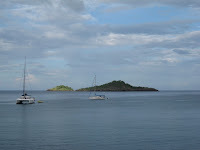 Our next stop was Pigeon Island, where we picked up a free mooring ball to go snorkeling. This area of actually two island is also called the Jacques Cousteau Underwater Park, because he declared it to be one of the top dive sites in the world. It was pretty rolly this far away from shore, so we didn’t waste much time and jumped in the water before I could get sea sick. Once in the company of coral and tropical fish, we executed our grand plan of circling the biggest island. Talking about a work out! It took us a little while, but at least we now know where the best snorkeling is to be found around these rocks. Since the anchorage on the mainland, across from Pigeon Island, is more comfortable, we opted to spend the night there, near Malendure Beach. Now this place is very popular with locals and white people alike and we have no idea why… The sand is black and littered, a mucky river empties out on it, the seawater is grey and it is very busy. In the morning, we wanted to go for a sign posted hike, but ended up in a housing development and gave up. It was Sunday and we needed some provisions. 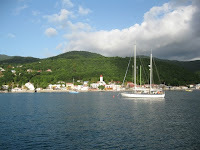 Our idea was to anchor off the marina in Basse-Terre, Guadeloupe’s capital, before noon to catch the store before closing. The sail down there was a bit tough, since the wind died down over and over again, just like on our trip to Pigeon Island. Only then, the wind shifted so much that we were actually sailing back north at one point! Now, at least we kept moving towards our destination, albeit very slowly. We dropped anchor in a bumpy harbor just after 12 pm and realized it wouldn’t be comfortable enough to spend the night. Down went the dinghy and all of us fought the beating heat to make it to shore. I had a half hour left to “stock up”. I only needed five minutes, since the store didn’t have anything interesting or healthy. A stop by the bakery revealed that they were out of bread. 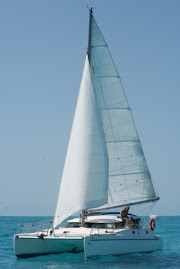 So, we got back to Irie, hauled the dinghy and the anchor back up and left. At least Darwin had a little break and swim on shore. The only other place we could go before dark was the Saintes, a group of islands south of Guadeloupe and an area well raved about. We looked forward to a short visit here. It was only 10 miles away and we could see them luring us over, but… the wind came exactly on the nose and under ten knots, while a few squalls passed nearby. Since we now are hardy sailors, we needed to prove a point and sailed all the way, avoiding a water spout in the distance. 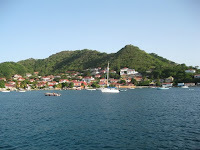 It “only” took us four hours and we did more than twice the distance to get to Bourg de Saintes, the main town on the islands. Terre-de-Haut is the most populated, popular and interesting island of the bunch. The three of us spent a few days there and enjoyed the cute, clean, colorful town with its welcoming and friendly village atmosphere. We also walked to a couple of other bays and lost gallons of sweat. 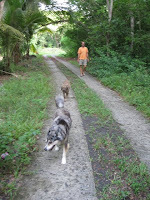 The Caribbean in the summer: it is hot and humid! Our last evening in the Saintes was spent in a harbor on Terre-de-Bas. A walk on shore revealed a very neat, organized and friendly community with well-kept parks, lots of hiking opportunities and child friendly areas. 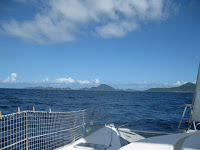 When we get back… But now, the weather was quite favorable to make the crossing to Dominica. nice.. and i'm seeing the full post in Google Reader now. Thx!